I had only gone to Japan on business trips. On every one of them I had very little time to look around. So, after an airline gave me a large voucher for volunteering to stay at the airport for several hours before taking a later flight, I took the opportunity to visit Japan on my own terms. I started in Tōkyō, staying in the Asakusa district and traveling all over the city on the excellent transportation system. Next I went to Kamakura, which is almost an outlying suburb of Tōkyō but which seems far away and very different. It seemed like a southern California beach town surrounded by terrain and forests of the Pacific Northwest, with many temples and shrines. Next, Nara, an even older capital of Japan. An enormous temple and statue date from the early days of Buddhism in Japan. Kofun or burial mounds are from an even earlier pre-historic era. Osaka was entirely different. It was almost entirely destroyed during World War II because it was a major port and the leading industrial center. Everything is new. On the other hand, everything is old in Koyasan, a mountaintop complex of Buddhist temples and monasteries. Finally, Nikkō is connected to the Tokugawa Shōgunate. Keep reading this page for more on getting to Japan and what I was doing there on business trips. Or jump to a specific topic. It's a long plane ride from the U.S. to Japan. Something over 10,000 km and about 12 to 14 hours from Chicago. The flight time depends on routing and winds, and given the long distance the variation between planned and actual can be significant. Plus, you cross the International Date Line. So it's something like you leave Chicago around mid-day, and then arrive in Tōkyō at about the same local time on the following day. Coming back is even stranger — leave Tōkyō in the afternoon, then arrive in the U.S. mid-afternoon of that same day. Haneda Airport used to be the primary airport for Tōkyō. After World War II it handled USAAF C-54 flights that had hopped from island to island from San Francisco. Northwest Orient started service to Haneda in 1947. Pan Am started service later that year. Then they built Narita Airport, well to the east of Tōkyō. International passenger service moved to Narita, and Haneda was almost entirely domestic passenger service plus cargo. The Ministry of Transport had restricted international passenger flights to operations between 11 PM and 7 AM, when there is no affordable public ground transportation to and from the airport. That has changed. Now there are domestic and international flights in and out of Haneda around the clock. It is now the world's 5th busiest airport in terms of the number of passengers: Atlanta, Beijing, Dubai, Chicago O'Hare, then Tōkyō Haneda. Haneda has more convenient transport into Tōkyō. A train runs every 20 minutes or so between Haneda and Asakusa Station, and from there it was just a few blocks to where I was staying. Get a PASMO card at the airport. It works on subways and regional trains nation-wide, and you can also make purchases in many stores and at vending machines. Hey, what's with all the diacritical marks over the o's? Kind of like Tōne-Lōc and Drānō, no? There are also some over a few of the ū's. They're macrons, used in the Rōmanji system of writing Japanese words in Latin characters. It marks a vowel as being long. That's long in terms of time duration, and not in the grade school phonics sense of "long vowels are those in the words bait, beet, bite, boat beauty, and short vowels are those in bat, bet, bit, bought, but." See the katakana and hiragana page for more on writing Japanese. 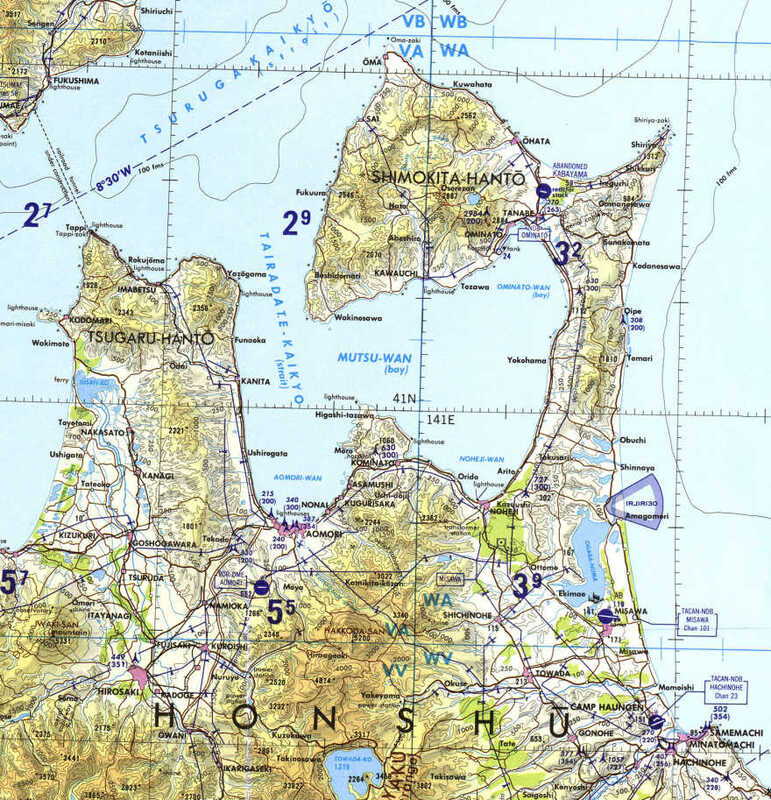 This map of Japan from the University of Texas' Perry-Castañeda Map Collection shows Narita Airport well outside Tōkyō to its east, and Haneda Airport on the harbor much closer to the center. Japan has a lot of public transport that moves quickly and often. Your biggest problem will be figuring out how to use it! 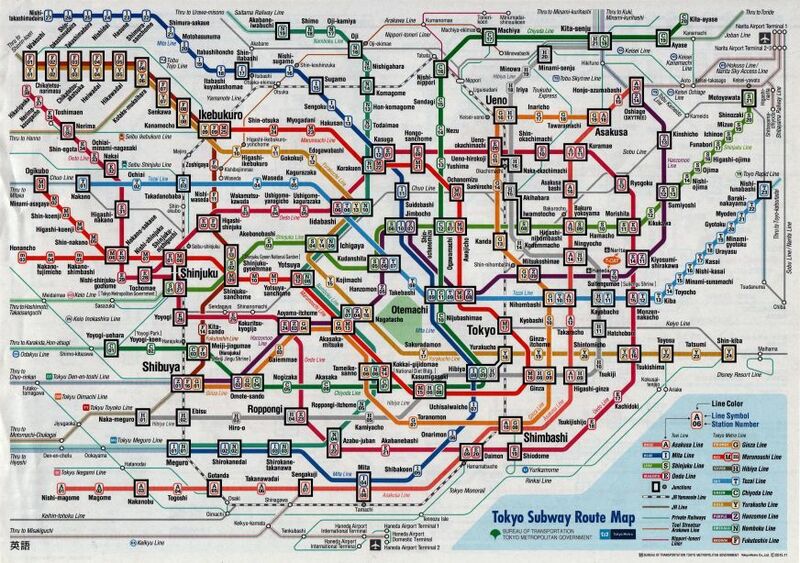 English maps are available, but the Tōkyō transportation system is so complicated that the maps tend to be overwhelming when you first encounter them. Major train stations like Shinjuku Station are worlds of their own. Shinjuku is the main connection hub for travel between central Tōkyō and the sprawl of Tōkyō and its suburbs to the west. An average of over 3.6 million people passed through Shinjuku Station every day in 2007. There are 35 platforms and over 200 entrances to the complex. So if you can't find your way out of the train station, you still have plenty to see and do. I had been to Japan three times, all of them on business, and all of them very frustrating short business trips. The first trip was when I had a research scientist position with Purdue University, the second and third were when I was doing training work for a U.S. based company, first teaching networking protocols to EMC in Tokyo, and then doing Linux work at Misawa Air Base. My first visit to Japan was a haze of inter-city train rides and ritualized business meetings. I have no pictures from that trip, and no advice beyond don't travel that way! The second time was a networking project for EMC, doing some customized network training for them at one of their offices near Shinjuku Station. That was when I wrote some TCP/IP haikus. Unfortunately, TCP/IP haikus have not yet caught on. If they would, they have the potential for significant improvements in computer networking. Better yet, or maybe worse, are the cryptographic haikus. The third time was for some Linux work at Misawa Air Base, way up at the northern tip of the main island of Honshū. Life on a U.S. overseas military base is largely a Halliburton-operated simulation of the former Confederacy. For meals you have a choice between Taco Bell and Popeye's Chicken. On the EMC job I was staying at the Keio Plaza hotel. This is a very high-end hotel in the central Shinjuku district of Tōkyō. Think of the hotel in Lost in Translation. The hotel in Lost in Translation was actually the Park Hyatt Tōkyō, but the Keio Plaza was similar in many ways. It has an elegant lobby staffed by several bellboys in uniforms and tiny hats right out of 1930s movies. The 1,450-room hotel, the first high-rise hotel built in Japan, is a pair of towers 138 and 178 meters tall. The company had suggested that I take the hotel shuttle bus, but I didn't want to ride from hotel to hotel through central Tōkyō for two to three hours. Get cash at the ATM while you're still in the airport. Then head downstairs to the complicated train station. Get a Pocari Sweat from a vending machine and try to figure out the train system. I took the Narita Ekusupurseu or Narita Express or just N'Ex train from the airport to Shinjuku Station. The hotel is a few blocks away, but tunnels lead most of the way. That was good as it was pouring down rain, and I didn't have to do much more outdoors than cross the road. I had a very nice room on the 29th floor of the hotel with a view out over the Shinjuku district. The room had a small bedside table with a built-in clock, room light controls, a night-light underneath, and channel and volume controls for the "radio", a choice of four audio programs. I encountered the same bedside hotel furniture in Hong Kong. The breakfast in a hotel like that is expensive if it isn't included with the business rate for the room. It's again similar to what I encountered in Hong Kong, where the locals aren't sure what the odd foreign visitors will want so they err on the side of variety. It's a big buffet with scrambled eggs, poached eggs, soft-boiled eggs, ham, bacon, some unusual sausages, french fried potatoes, pasta, salad, pasta salad, bread, cucumbers, cherry tomatoes, sliced kiwi fruit, and more. Plus juices, coffee, and several varieties of tea. A more typical breakfast in Japan would be something like onigiri, a sticky rice ball rolled in seaweed paper with something like salmon or tuna inside, a spicy meatball, and a small piece of an egg dish similar to quiche. The job site was just a few blocks away, and it was an interesting walk through Nishi-Shinjuku, the skyscraper business district near the Shinjuku Station. This was where Japan's skyscraper building trend really began in the 1970s with the Keio Plaza. The two-towered building in the first picture below is the Tōkyō-to Chōsha or Tōkyō Metropolitan Government Building. The whole thing is a complex of three buildings, each of them occupying an entire city block. Building Number 1, seen here, is the most prominent, being a tower that splits at the 33rd floor and continues as two separate towers to 48 floors. It's meant to simultaneously resemble a Gothic cathedral with its two towers, and an integrated circuit with its detailed facade. Japanese science fiction often depicts some version of this building as a feature of a post-apocalyptic or futuristic Shinjuku district. My job was in EMC's offices in the Shinjuku Mitsui Building, seen on the right side of the second picture above. It's the one with the diagonal bracing in its end. Lunch each day would be a bentō box lunch. Several places at street level sold them and there was a park nearby that made for a pleasant place to have lunch. The class ended about 4:30 PM each day, at which point I would go back to the hotel, change clothes, and head right back out to explore the area. With Shinjuku Station right there, I could easily get to anywhere in Tōkyō if I wanted. But there was plenty to see and do in the brightly illuminated Shinjuku district. The best area was the back alleys just north of Shinjuku Station, almost under the tracks. The alleys are lined with little smoky izakayas or Japanese taverns, many one two to three meters wide. The alleys are narrow and almost covered over with signs and awnings. There's very little signage or labeling in anything other than Japanese. Well, of course, we're in Japan after all! Walk around until you find people eating something that looks good. Squeeze into the place and point at what you want. Expect very little English to be spoken or understood. The area is much like Blade Runner, except with less rain and fewer robots, at least when I was there. There are plenty of places to get a quick and relatively cheap meal. Lots of places have carry-out bentō box meals. Train stations have sit-down places. They almost all have plastic replicas of the available food and drink in a display near the entrance. So, if all else fails, you can simply point! There are a lot of curry shops. Japanese curry, not South Asian curry. In a typical curry shop you pay at the register as you enter and get plastic tokens. Seat yourself at the counter and turn over the tokens to collect your food and drink. Soup-based restaurants with ramen and udon and soba often work the same way. My third time in Japan was for some Linux work at Misawa Air Base, way up at the northern tip of the main island of Honshū. Misawa is an unusually busy facility. It houses units of the U.S. Air Force, Navy, and Army, plus the Japanese Air Self Defense Force. The single 10,000' runway is also used for commercial flights. Misawa is a joint U.S. military base, primarily a Pacific Air Forces base with the 35th Fighter Wing as its host wing, and also the 373rd Intelligence, Surveillance and Reconnaissance Group and the 301st Intelligence Squadron. The 35th FW was flying F-16s. It also hosts U.S. Navy units, primarily the Patrol and Reconnaissance Force of the Seventh Fleet and the Navy Information Operations Command Misawa (formerly the Naval Security Group Activity Misawa). The Navy was flying P-3 Orions and EP-3E ELINT aircraft. Plus, for good measure, the U.S. Army's 403rd Military Intelligence Detachment (formerly the 750th Military Intelligence Company) is here. Misawa is also the Japanese Air Self Defense Force's Northern Air Defense Force Headquarters, and hosts the JASDF 3rd Air Wing. They were flying air defense fighters and the E-2C mini AWACS, plus fighter trainers. Aeronautical chart of Japan from the University of Texas' Perry-Castañeda Map Collection. The two at Misawa and Elmendorf were, as of 2009, the last two in operation. I was jet-lagged for much of the trip and waking up at 0300. There's not much to do at 0300 when you're stuck on an overseas USAF/USN base. Halliburton and its former subsidiary KBR work very hard to make U.S. military bases into microcosms of the Confederate States of America. * Not generally considered to be actual music. It's all NASCAR, Taco Bell and Popeye's Chicken, and low-power FM transmitters spewing Rush Limbaugh and country "music"* plus a token percentage of hip-hop. 1386 unknown Russian Radio Liberty / VOA ? See the asiawaves.net site for broadcast frequency tables. 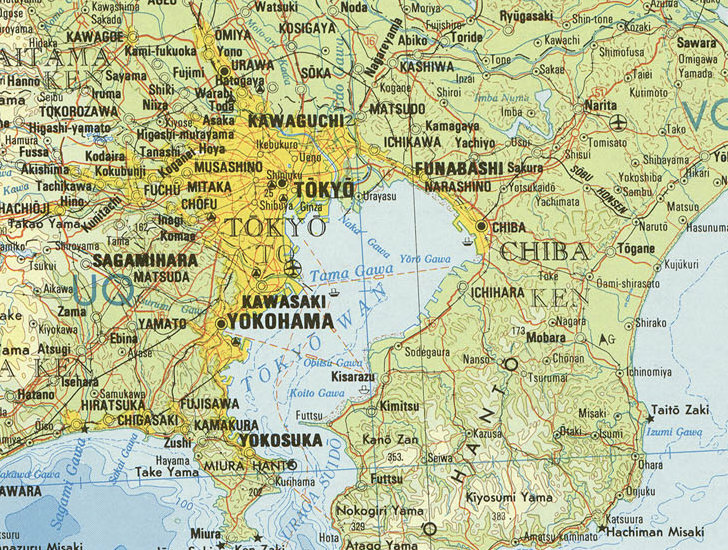 FM broadcasting in Japan is on 76-90 MHz, an unusual range of frequencies. 90-108 MHz carried VHF television channels 1 and 2 until the July, 2011 analog shutdown. Most of the world uses 88-108 MHz for FM broadcast. The former Soviet Union and eastern Europe used 66-74 MHz but that is mostly discontinued now. In the early evening you can go to a movie on the base theatre. Being a base theatre, everyone knows to jump to their feet as the lights dim. That's everyone except the confused visitor, of course. The U.S. national anthem is played as a waving flag is displayed. Then there are some short films promoting the idea of joining the military. Yes, recruiting happens on a military base. Then they play the movie. At 1630 each afternoon, the U.S. and Japanese national anthems are played on loudspeakers spread around the base. If you are walking outdoors (or driving) you are supposed to stop during the music. I didn't get to travel fifty kilometers southwest of Misawa, west of Hachinohe, to the village of Shingō and its odd local legend of the Tomb of Jesus Christ. The story is that the "Takenouchi Documents" were copied about 1,500 years ago from even older documents, passed from generation to generation in the Takenouchi family while men from that family served as priests at the Koso Kotai Jingu shrine in Isohara, in Ibaraki Prefecture. Documents said to pertain to two small graves on the Sawaguchi family's ancestral land in Shingo turned up in the 1930s among the possessions of Koma Takeuchi, one of those Shintō priests in Isohara. The papers were said to be written in an ancient form of Japanese, although others claim it was a form of Hebrew. The original scrolls were seized by the authorities, taken to Tōkyō, and lost in World War II. The graves were located in a bamboo grove on a small hill in 1935. Scholars concluded that the grave on the right is that of Christ, and the other holds his brother's ears and a lock of the Virgin Mary's hair. According to the legend, Jesus visited Japan during his "lost years" and studied its language and culture before returning to Palestine. Then his younger brother, Isukiri, took his place and was crucified. Jesus fled to Siberia, crossed to Alaska, and a few years later arrived by sea at the port of Hachinohe. He settled in Shingō, became a rice farmer, adopted the name Herai Taro Dai Ten Ku, married the Lady Miyu, had three children, and lived to the age of 106. Members of the Sawaguchi family still live in the area, believed by some (but not the Sawaguchis themselves) to be the descendants of Jesus. Meanwhile, a self-styled "cosmoarcheologist" named Wado Kowaka claimed to have transcribed the original "Takenouchi Documents", including the parts about how the ancestors of the human race came from outer space and what really happened to Atlantis. That's quite a feat, given that the documents were lost before 1945 while Wado Kosaka wasn't born until 1947 (and died in 2002). He also claimed on a television program to have contacted a UFO and to have a "Ph.D." from Pacific Western University, a diploma mill based in Hawaii in 1988-2006. You can read his "translations" here. Or at least you can see them, you'll need to know Japanese in order to really read them. All this seems to have had some influence on the Mahikari religious movement founded in 1963. I finished the job at Misawa on Friday afternoon, and packed up the gear and turned it over to the shipper. Then I flew down from Misawa to Haneda Airport and stayed overnight at a hotel near the airport. My flight back to the U.S. was late in the afternoon of the following day, so I could go into Tōkyō, store my luggage in a locker at a train station, and look around for a few hours. This bus will take me from the hotel to Tenkubashi, where I can get on the monorail train to Hamamatsuchō and then transfer to the JR Yamanote line to Ueno. My Russian backpack rode in spacious grandeur in a nearly empty commuter train from Hamamatsuchō to Tōkyō very early on a Saturday morning. They drive on the left. Not that you're likely to operate a motor vehicle there, but look both ways when crossing the street so you don't get hit. Bus drivers wear white cotton gloves. So do railway attendants, police, customs officials in the airport, pretty much anyone working in public. Every county has their quirks. The U.S. has rent-a-cop security guards everywhere wearing vaguely police-like costumes and often sporting Russian prison haircuts for a more intimidating look. Compared to that, white cotton gloves are interestingly distinctive but not at all strange.